What MailPlatform Triggers and Actions are Supported? New Contact - Triggers when a new contact is added to the subscriber list. 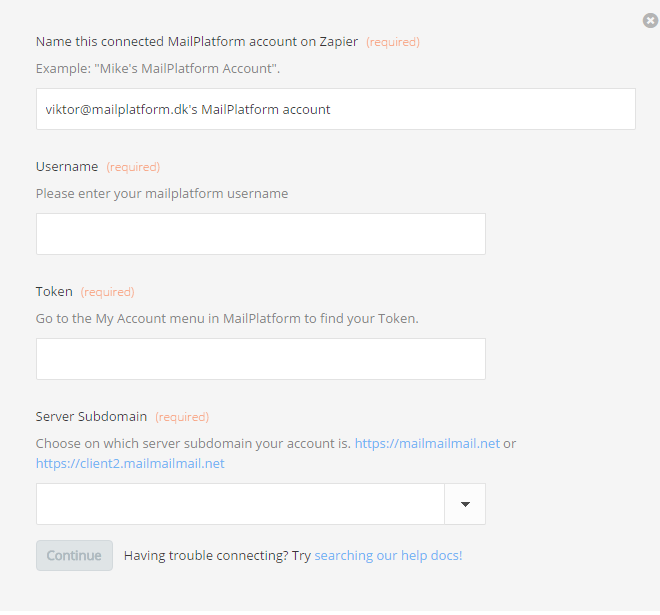 To get started with MailPlatform on Zapier, first you will need to click to connect your MailPlatform account to use with your Zap. Next, you'll be asked to name your MailPlatform connection and enter your username and token and select your MailPlatform server subdomain. To find your token, login to MailPlatform application. Click on the My account button on your right top side of the screen. A new window will be displayed with your token. Enter your username, paste your key back into your Zapier account, select your subdomain and then “Continue”. If your API was entered correctly your MailPlatform account will now be successfully connected.